Demolition derbies are events with wide-ranging appeal - delighting viewers of both genders and all ages. This motorsport originated in the United States and quickly spread to Europe, most frequently occurring at festivals or fairs. 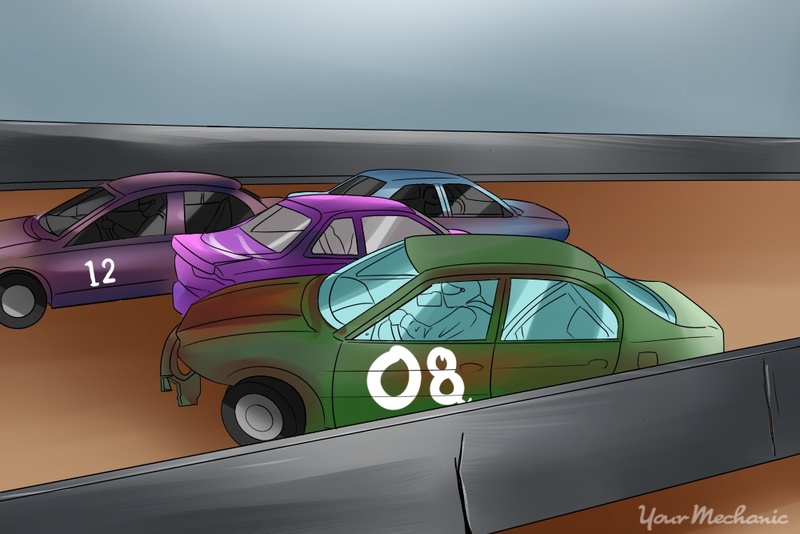 The basic premise is to let an array of cars loose in an enclosed area, where they continually run into each other until only one car remains running. They inspire an infectious excitement in the crowd as onlookers cheer on the relentless crashing and bumping of cars. It’s natural to want to change roles from viewer to participant when you’re caught up in all the buzz. If the desire to be down in the demolition derby pit doesn’t subside, you just might be ready to enter your own car into an event. Step 1: Find derbies near you. Conduct an internet search of demolition derbies in your area or call a local demolition derby promoter to discover what opportunities are available. Step 2: Review the rules. 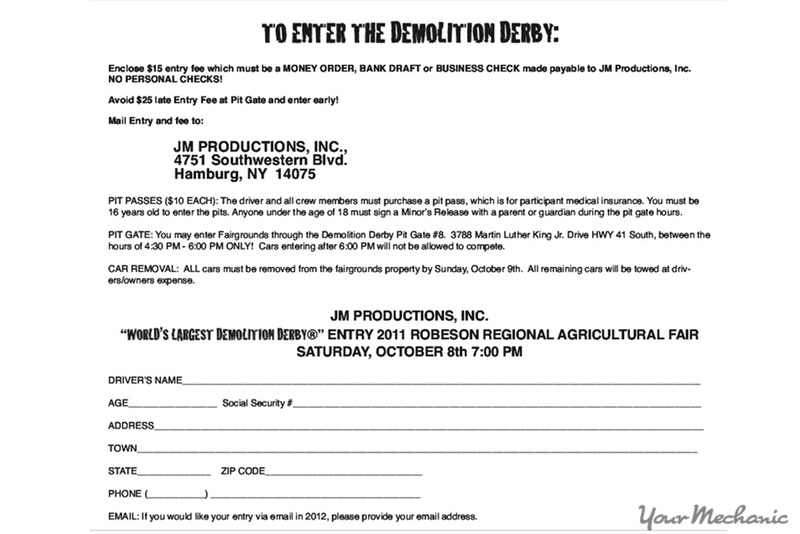 Once you locate an upcoming demolition derby event that appeals to you, review the rules with a fine-toothed comb. Every derby is different with its own set of rules, regulating everything from the type of seat belt used inside each car to what’s expected in the driver’s performance background. Make sure you qualify to participate and can reasonably expect to fulfill all expectations in your vehicle before you begin to prepare. While it is possible to enter a car in a demolition derby without a sponsor, it will be far easier on your pocketbook if you find a business to share the expenses involved. Step 1: Ask local businesses. Approach any businesses with which you deal regularly, such as auto parts stores, restaurants, or banks, and also branch out to those you don’t know so well, such as used car lots that could benefit from the exposure. Ask if there is interest in donating money to your cause in exchange for an advertisement on your derby car and a mention as your sponsor on the event’s program. Since it is relatively cheap advertising, you never know who might bite at the opportunity to be your sponsor. Note: When making your sales pitch to potential sponsors, place the emphasis on how having their business name on the program and on your derby car can help bring business to them rather than how their donation will help you. Finding your derby car is one of the most important parts of demolition derby prep, and it’s possible you already have a candidate in your possession. After all, next to the driver, the car is the most important ingredient in participating in a demolition derby. Step 1: Know what kind of car you can use. 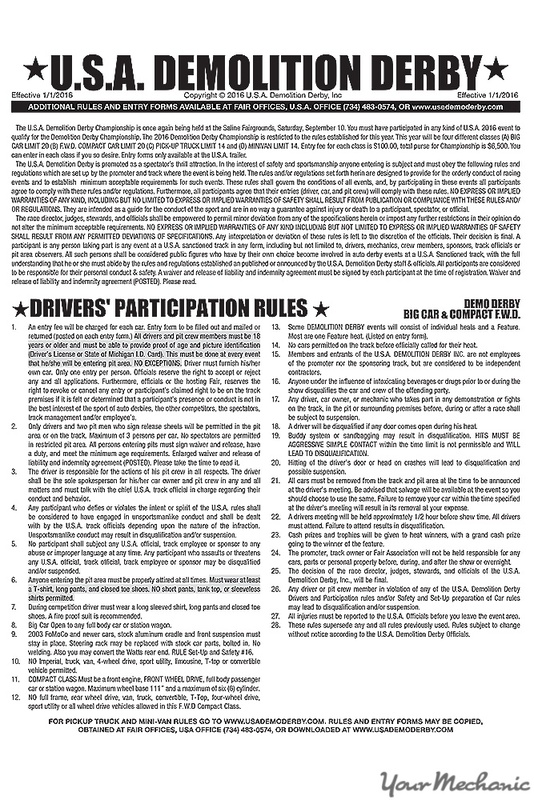 Ensure you understand the event rules about what is expected in participating cars because certain types might be banned from the gravel bullpen. Chrysler Imperials and cars equipped with their engines, for instance, are often prohibited from participating because they hold up far better under impact than other cars, giving what many derby enthusiasts deem an unfair advantage. Every derby is different, so it is crucial to understand what is and is not allowed in a car. Step 2: Find a car. Hit the ground running in your search, checking out classifieds ads, used car lots, and even wreckers for something you don’t mind destroying but still runs. Spread the word among friends and family about looking for a cheap car that isn’t fancy. Note: Look at potential derby cars for what they are - something that needs to withstand a lot of wear and tear in a very short period of time - rather than a long-term investment. Since the surfaces of most derby pits, or bullpens, are conducive to sliding around, the size of the engine isn’t that big of a deal. Tip: As a general rule, look for the biggest cars you can because greater mass results in greater inertia, which will cause the most amount of damage to anyone hitting you during the event while providing the most protection to your own car. 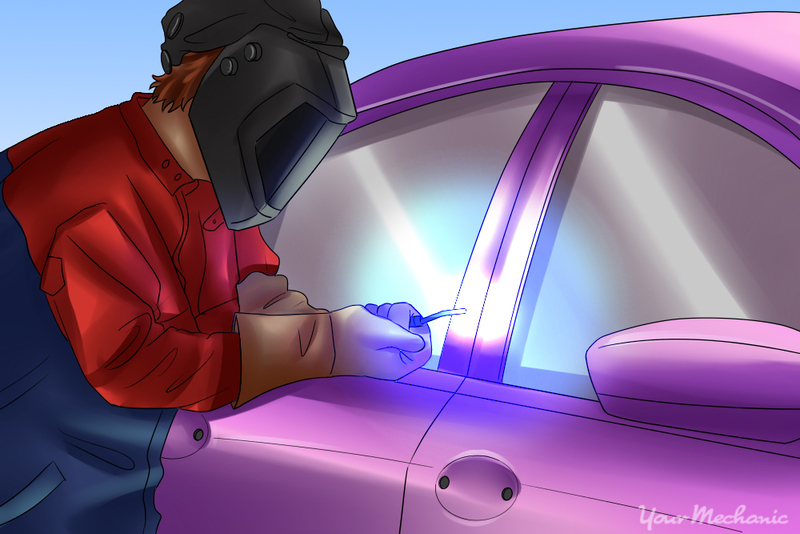 If you are in doubt of if a potential car can handle the rigors of demolition derby, consider consulting our mechanics for a pre-purchase car inspection. Step 1: Remove some of the wiring. Remove most of the original wiring, leaving only the essentials behind that run to the starter, coil, and alternator to avoid a derby loss due to an electrical glitch. With fewer complications in the wiring, there is far less chance of a minor electrical issue, such as a short, affecting the driving performance of the vehicle; if an electrical problem does occur during the competition, your pit crew will less problem diagnosing the problem with only a few possibilities. Step 2: Remove all glass. Remove the glass to prevent injuries to the driver upon the inevitable barrage of impacts that will occur during the demolition derby. This is standard procedure in all derbies. Step 3: Weld all the doors and the trunk shut. While this won’t guarantee they won’t dislodge and open during the course of the demolition derby, this step greatly reduces the risk of them flying open during heats. Step 4: Remove the radiator. Many derby participants even recommend removing the radiator, although there is much debate over this within the derby community. Since the event is so short and the car will be ready for retirement when it is over, there are no serious risks involved if the car overheats. If you do not remove the radiator, most derbies require that the radiator stay in its stock position. You’re going to need some trusty friends to do on-the-fly fixes during the event and between heats to keep your car running as long as possible. These people require a little mechanical know-how - enough to change tires, batteries, and more. Have two or more spare tires, a couple of fan belts, an extra starter, and a spare battery at a minimum to bring to the derby, and arm your crew with the tools they need to replace these items on your car in a pinch. Step 1: Fill out an application. Fill out the application to enter the demolition derby of your choice and mail it to the appropriate address with the required fee enclosed. Tip: Make sure you get the form and fee delivered by the deadline, or you may not be able to participate or will at least need to pay an additional late fee. Participating in a demolition derby is something few people can say they have done, and it is an unforgettable experience. It does require a lot of time and effort in the preparation. For those prepared to take on the hardships, however, there is the satisfaction of having followed through with something spectacular and perhaps a win to go with it.